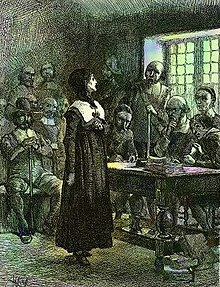 Anne Hutchinson, born Anne Marbury (July 1591 – 20 August 1643), was a Puritan spiritual adviser, mother of 15, and an important participant in the Antinomian Controversy that shook the infant Massachusetts Bay Colony from 1636 to 1638. Her strong religious convictions were at odds with the established Puritan clergy in the Boston area, and her popularity and charisma helped create a theological schism that threatened to destroy the Puritans' religious experiment in New England. She was eventually tried and convicted, then banished from the colony with many of her supporters. Better to be cast out of the church than to deny Christ. As I do understand it, laws, commands, rules and edicts are for those who have not the light which makes plain the pathway. He who has God's grace in his heart cannot go astray. As quoted in Little Journeys to the Homes of Great Reformers (1907) by Elbert Hubbard. Referring to Titus 2:1-5 "Speak thou the things which become sound doctrine: That the aged men be sober, grave, temperate, sound in faith, in charity, in patience. The aged women likewise, that they be in behaviour as becometh holiness, not false accusers, not given to much wine, teachers of good things; That they may teach the young women to be sober, to love their husbands, to love their children, To be discreet, chaste, keepers at home, good, obedient to their own husbands, that the word of God be not blasphemed." I shall I not equivocate, there is a meeting of men and women and there is a meeting only for women. One may preach a covenant of grace more clearly than another, so I said. . . But when they preach a covenant of works for salvation, that is not truth. If you please to give me leave I shall give you the ground of what I know to be true. Being much troubled to see the falseness of the constitution of the church of England, I had like to have turned separatist; whereupon I kept a day of solemn humiliation and pondering of the thing; this scripture was brought unto me — he that denies Jesus Christ to be come in the flesh is antichrist — This I considered of and in considering found that the papists did not deny him to be come in the flesh nor we did not deny him — who then was antichrist? . . . The Lord knows that I could not open scripture; he must by his prophetical office open it unto me. . . . I bless the Lord, he hath let me see which was the clear ministry and which the wrong. Since that time I confess I have been more choice and he hath let me to distinguish between the voice of my beloved and the voice of Moses, the voice of John Baptist and the voice of antichrist, for all those voices are spoken of in scripture. Now if you do condemn me for speaking what in my conscience I know to be truth I must commit myself unto the Lord. I will give you another scripture, Jer. 46. 27, 28 — out of which the Lord shewed me what he would do for me and the rest of his servants. — But after he was pleased to reveal himself to me . . . Ever since that time I have been confident of what he hath revealed unto me. . . Therefore I desire you to look to it, for you see this scripture fulfilled this day and therefore I desire you that as you tender the Lord and the church and commonwealth to consider and look what you do. You have power over my body but the Lord Jesus hath power over my body and soul, and assure yourselves thus much, you do as much as in you lies to put the Lord Jesus Christ from you, and if you go on in this course you begin you will I bring a curse upon you and your posterity, and the mouth of the Lord hath spoken it. . . Governor John Winthrop, beginning the interrogation at her trial. She was a woman of haughty and fierce carriage, a nimble wit and active spirit, a very voluble tongue, more bold than a man. Words from the inscription on the statue in front of the State House in Boston, Massachusetts, erected in 1922.